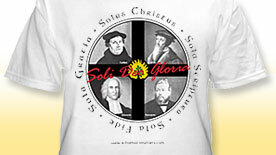 David Jacks, in 1995 while studying at SWBTS, circulated a shirt bearing the names and likenesses of Martin Luther, John Calvin, Jonathan Edwards and Charles Spurgeon. 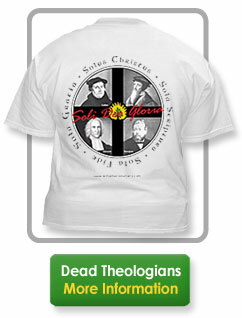 The shirt was affectionately known as the "Dead Theologians Society t-shirt." 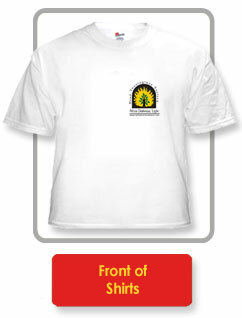 Since that time, the "DTS" shirt has been re-vamped and has now taken the form of the shirt shown on this web site. Reformation theology has played an important role in the history of Christianity. With the recent resurgence of Reformation theology, many adhering to the Doctrines of Grace search for ways to expose the world to their beliefs. This shirt "with a bunch of dead guys on the back of it" peaks the interest of onlookers and provides an excellent bridge for introducing these "dead guys'" Biblical beliefs. The front of the shirt bears a likeness from the symbol of the 16th Century Protestant Reformation - a "burning bush" with the phrase "After Darkness, Light." 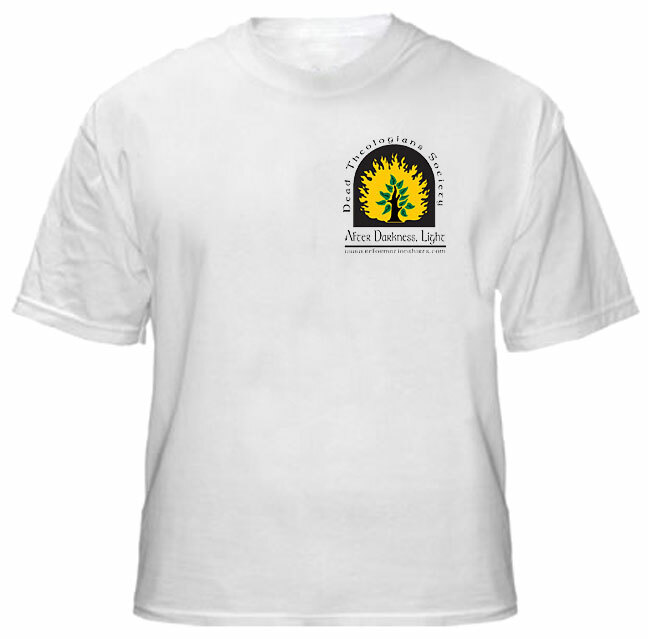 The "burning bush" symbol and the phrase were used by the Reformers to represent the light of the Gospel of Grace overcoming the darkness of the Law of Works propagated by the Roman Catholic Church in the centuries leading up to the Reformation. 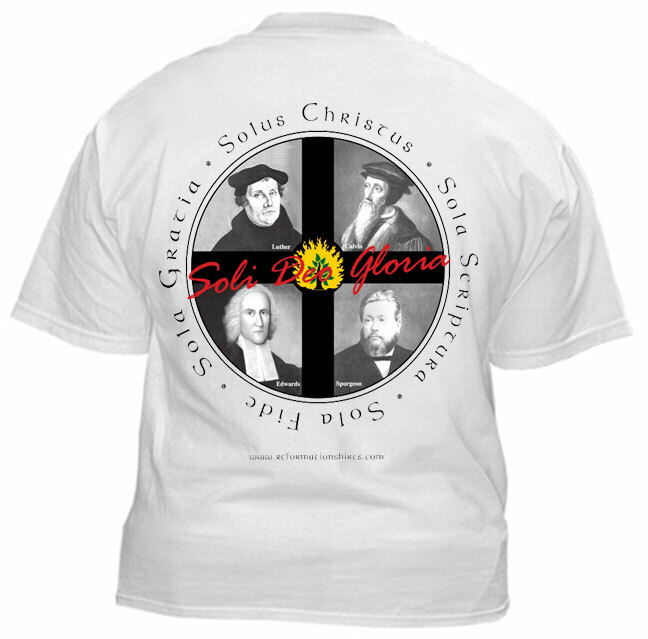 The back of the shirt bears the names and likenesses of four of the best-known Protestant Reformers spanning a period of 400 years. A German monk named Martin Luther (1483-1546), whose heart was captured by the belief of Sola Fide (Faith Alone for one's Justification), sparked the Protestant Reformation on October 31, 1517, when he nailed his 95 Theses to the door of the Cathedral in Wittenberg, Germany. Swiss theologian John Calvin (1509-1564) with his emphasis on God's sovereignty and union with Christ, helped codify the teachings of the Reformation with his first edition of The Institutes of the Christian Religion in 1539. New England Puritan Jonathan Edwards (1703-1758), best known for his sermon "Sinners in the Hands of an Angry God" and his book Freedom of the Will, helped fan the spark of revival in The First Great Awakening and spread flames of salvation concerning the holiness and grace of God in America in the early to mid 18th century. Englishman preacher Charles Spurgeon (1834-1892) spread the Doctrines of Grace in the mid to late 19th century with his passionate and eloquent sermons on the sovereignty and grace of God. May you, too, be inspired and blessed by the truths conveyed on this shirt each time you wear it. And may your whole life be lived in loving obedience. Soli Deo Gloria - TO THE GLORY OF GOD ALONE!